Sweep your love off of their feet with a Chicago Romance Helicopter Tour over the city! This private VIP tour over Chicago, for up to 2 passengers, includes a 15 minute (approximately) narrated helicopter tour in a luxury helicopter, a champagne toast, decadent chocolate and epic views of Chicago. Take date night to new levels with the truly unique and special Chicago Romance Helicopter Tour. This tour is offered day or night - either at the same price. Whatever time you select, this premiere tour will wow your love while it provides spectacular views of Chicago’s skyline and landmarks. Book this tour today and experience romance in flight. Up to 2 passengers. 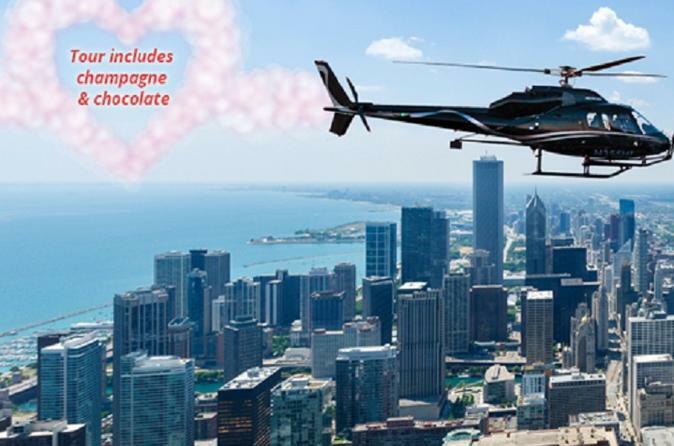 Love is in the air all year long with the Chicago Romance Helicopter Tour! Create an extra special date night that starts at Vertiport Chicago’s state-of-the-art facility located in downtown Chicago, just minutes from the loop. There, you and your sweetheart will be greeted with delicious champagne and decadent chocolate as a special treat before your flight. Together you will then walk down the red carpet, like a VIP couple, to the tarmac where your luxury helicopter awaits and your moment is captured in a photo, that will be available to purchase and download to commemorate your romantic date. Next, you will embark on a 15 minute (approximately) private VIP helicopter tour in a luxury helicopter where you will experience the epic views of Chicago as you soar above the city. Get a front row seat to the towering historic landmarks and spectacular sites including: Willis (Sears) Tower, Millenium Park, the Magnificent Mile and more! The breathtaking views from above the city, along with interesting narration by your pilot, provide a truly unique perspective of Chicago. Both lifelong residents, and first time visitors to the city, will agree that this premiere helicopter tour is an experience you will not forget! Whether an anniversary, a date night or simply to say “I Love You”, the Chicago Romance Tour is sure to sweep your date off of his or her feet and make a lasting impression. This is a private tour for up to 2 passengers. Please note that passengers must be 21 years of age or older to receive and/or consume alcoholic beverages. Champagne is subject to change to sparkling wine.